This entry was posted in Picture Books and tagged ABC books, Perfect Picture Book Friday, picture book, Susanna Leonard Hill. Bookmark the permalink. Oh how fun and clever! Can’t wait to check this one out! It’s great, Iza. It just proves that everything has been done but finding a unique way to do it makes it feel “new”! I’ve got all my paws up! I’ll be looking for this one for sure!! Thanks! Oh, Penny, you are so funny! And this book sounds as delightful as you are. My #1 grandblessing is just beginning to read and #2 is not far behind….this sounds like a must for them. I’m glad I’m not the only one laughing at my posts. I always hope someone will get my sense of humor! How exciting that your grandchild is starting to read. Such fun! Fabulous! Another one that makes you wonder why it hasn’t been done before. I know! Isn’t it fun when a author nails a new way to bring us an old subject??!!! Great review. Escalating chaos, color and fun. Wait a minute, this isn’t a story in rhyme? Hahaha! Thanks, looks great! It’s not in rhyme! But will still rank up there with my faves! Just ‘taking you on the arm’, German for pulling your leg. Glad you explained! I would’ve wondered if this was spam! LOL! I can see I need to get to the bookstore. This one sounds really fun. Thanks for telling me about it. Ha! Perfect Picture Book Friday never leaves us wanting for good book choices does it? I saw this on someones 2013 list (that I just read yesterday). CANNOT wait to get my hands on this. I hope you find it soon, Stacy! And I hope you enjoy it as much as I did! It struck while reading your review, how authors really give teachers excellent and entertaining books, to help teach ordinary subjects. What a unique book! 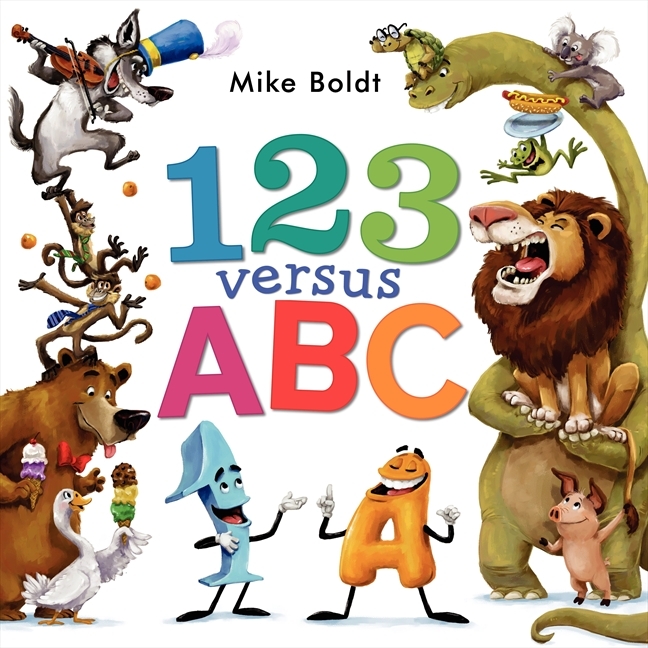 I could see how kids would just love reading this book and taking more interest in numbers and letters. Liked your activities for using the book. Yes! Keeping in teachers in mind can’t help but boast an author’s appeal. I’m glad you liked the activities. I just touched the tip of the iceberg, of course. Teachers could take this and run with it. OK, I”m awake now! (Whew, I thought I was sleepy this morning) Bright colors and fun text make this book sound terrific. I too have both hands up repeatedly for this book. I need to read it. Hands in the air!! This book deserves it! This looks AWESOME! It reminds me of SHARK VS. TRAIN, which was a big hit on our house. I hope our library has it. Incidentally, ABCya is my five-year-old’s favorite Web site. Lots of learning fun there. Isn’t ABCya great??? They did it right! Love your clever colored text in the post, just like the text in the book. The PW review “Will make kids laugh from A to 26” – perfect! PW is right! I don’t know how a kid could laugh more than I did! It’s delightful, for sure. I think your granddaughters will love it! Thanks for coming by! It’s a both-hands-in-the-air book! Hope you like it as much as I do.